It’s Sunday afternoon and we’re watching the Talladega Sprint Cup. We don’t usually watch NASCAR, but it’s a lazy Sunday afternoon and we’ve done just about everything else we needed to do this weekend, so it seems like a suitable pastime at 4:30 on a Sunday afternoon. I’m only watching it because they have a Ricky Bobby car (no. 51). You do know about Talladega Nights, right? One of the greatest movies ever made? Actually, anything with Will Ferrell is the greatest thing ever made. I could watch that doofus in anything and pee myself laughing. 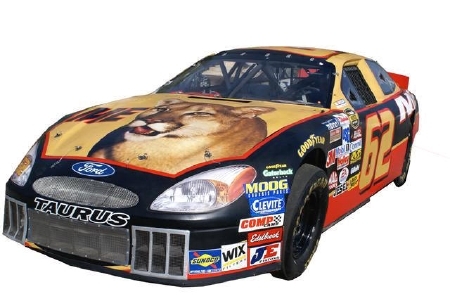 But in today’s race, someone apparently has lost his sponsorship and has painted the Ricky Bobby cougar on his hood. And his tail says “ I Wanna Go Fast.” I’m loving it. AND he’s currently in second place. So I’m yelling and cheering him on. *UPDATE: Dangit, my boy just crashed at 4:43. I’m quite despondent. But he’s not going to go out quietly, no sir. He’s now driving the wrong way down pit row, in true Ricky Bobby spirit. I swear if he jumps out and starts yelling he’s on fire, I’m going to fall off this couch. 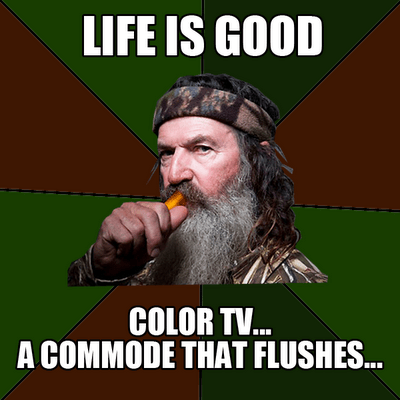 But “Duck Dynasty” might be A&E’s greatest triumph. 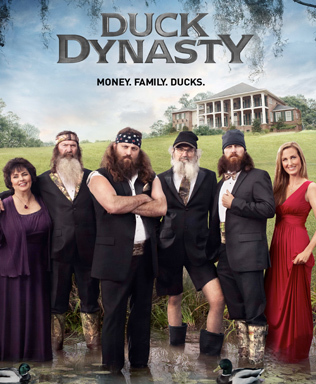 The show follows the Robertson clan, a family from West Monroe, Louisiana. Now, I’m a bit familiar with that neck of the woods – I have an aunt who lives in the tiny little town of Bernice, which is nearby. I even spent a summer there in high school. In true white-trash fashion, I was dropped off by my mom’s truck driver boyfriend at the beginning of summer, and picked up in the same fashion at the end of it. I spent the summer running wild with my boy cousins and their extended family on their dad’s side, riding ATV’s, pestering wild animals (mostly frogs and crocodiles) in the dense woods surrounding their property, and fishing in their lake. In the evenings, I would help my poor beleaguered aunt out by shucking purple hull peas and helping fry hush puppies. It was a really good summer. 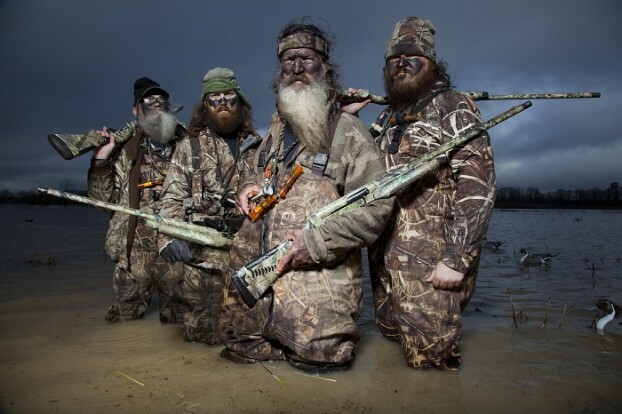 Anyway, “Duck Dynasty” follows the shenanigans of Willie, the CEO of Duck Commander, a multi-million company that makes duck calls and duck decoys; his brother Jase, who works for the company, as well as his other brother Jep, who you see a lot less of. 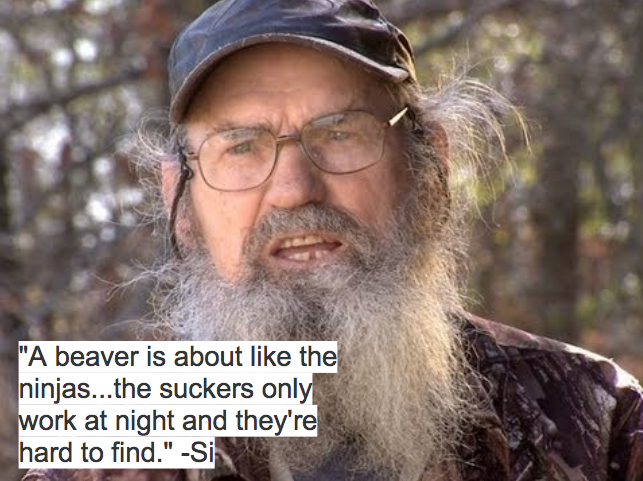 But the real characters are Willie’s father and the Duck Commander founder, Phil and his brother, Si. They all look like ZZ Top, and they have unbelievably hot wives. The older generation is plumb crazy. Si is a former Vietnam Vet who I’m pretty sure still thinks he’s in the midst of the war. Phil has tons of folksy wisdom to dole out, most of it regarding how to deal with womenfolk. The whole family kills beavers, frogs, ducks, bees, just about anything that might attract their attention. They have a lot of anger towards the animal kingdom, but especially beavers. Pretty much every episode ends on a preachy note, with the family gathered around a dinner table for a big family dinner and a voice over of Willie telling us what we were supposed to learn out of the episode. It’s the one thing I don’t like about the show. Actually, the other thing I’m not too fond of is that some of the show is definitely faked and revolves around some sitcom-like situations. For example, Willie buys a winery, but knows nothing about wine. Hijinks ensue. Phil’s wife Kay wants to open a restaurant, so a local restaurant let’s her set up shop for one night. Hilarious mayhem results. It’s a bit forced sometimes. But back to that folksy wisdom. One of my favorite things about the show is some of the quotes these guys throw out. Here are a few of my recent favorites. I believe what Si is saying here is that you have to be very careful not to be sissified. It’s true. You must maintain your manliness at all times. Si and company are quite, quite worried about sissification, especially among the grandkids. Ah, yes. Fake it till you make it. And fake it fast. Yep, been there, done that. I’ve been free labor. Similarly, you definitely get what you pay for. Well, that’s just a fact. Well, I am honored to have been mentioned(in a good light at that) I had forgot about that summer.We still live in the same neck of the woods. The town is a bit of nothing and I don’t think we were living in our Log house back then. If you are ever in the area our door is always open (literally). Come July I will be shelling purple hull peas, frying chicken, and making hot water cornbread. You would have to promise not to critique it. It may sound cliche but I miss you terribly and am so very proud of you. I haven’t even watched that show yet, a few years ago Phil came to a wild game supper at our church and gave his testimony. Oh man, I’d love to have been at that supper. Not for the churching aspect, but to hear Phil. That must have been something. Me too! It seems like a very time-consuming process and the small staff (well, the staff we see at least) don’t seem terribly efficient or productive. I bet there’s more than meets the eye on this whole duck-call business. I think you need to do some commercials for lipton tea or the brand you use…could be a big promo too.